Background: the name Sonnar represents a type of Zeiss design by Dr. Ludwig Bertele that was first introduced in 1924 (the name refers to "sun" in German—Sonne—a reference to the fast aperture). Sonnar lenses typically have rear elements that get quite close to the focal plane, so usually only appear on rangefinder cameras (and these days, mirrorless cameras). While some people get all excited about various Zeiss lens names (Planar, Sonnar, Tessar, etc. ), to me they just represent a logical grouping of optical design. I don't hold the notion that one Zeiss named design is better than another, just different. Many different manufacturers have used Sonnar-type designs; I find it a bit pretentious to try to make that into something more than it is (i.e. 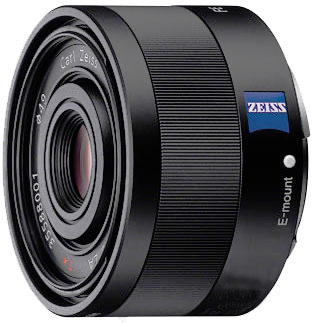 by referring to it as a Sonnar instead of what it is: a Sony Zeiss lens).